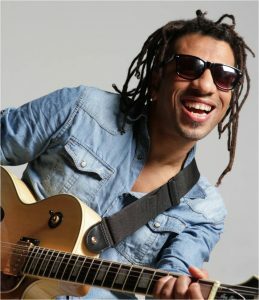 This evening Cafe Globen will be hosting the brazilian singer Xandele on his guitar and with support on percussion/drums. Xandele will be playing and singing MPB (Brazilian Popular Music) and there will be the possibility to sing along as some of the texts of the songs will be shown with a projector. Xandele is one of the most promising talents of brazilian samba rock. As musician and composer, Xandele represents an eclectric style that includes funk, groove, samba, swing rock and jazz. In 1998, Xandele was the winner of the first musik festival of Porto Alegre in Brazil, with his song “O cor do som” (The color of sound). Since then, he has performed in numerous project, together wit famous brazilian artist and bands such as Bedeu, Banda Ultramen, Casa da Sogra, Hyldon, Luis Vagner, Tonho Crocco, Marku Ribas, Bebeto, Clube do Balanço, Limusine Negra among others. Xandele played concerts in known venues in Porto Alegre, Rio de janeiro and Sao Paulo, as well as in Barcelona, Vienna, Paris, Berlin, New York and also last year in Copenhagen.We hope to see you all at this wonderful concert with this great singer.